These little drops of ageless elegance are glorious with any outfit, on any occasion. From radiant bride to stunning fashionista, at Andrew Mazzone Design Jeweller we’ll find you a true pearler of a piece in our exquisite collection. Whether you select something from our in-store display or you have a specific design in mind, we source our pearls from the best suppliers in Australia. Because pearls are organic products of living creatures, they are unique among gemstones with different grading standards that determine their quality, value and beauty: shape, size, colour, lustre, surface quality, nacre quality and matching of pearls. Naturally, pearls come in a variety of shapes: round, oval, teardrop and button. The more unusual asymmetrical shapes are known as baroque or keshi pearls. If a pearl is more symmetrical it’s regarded as more valuable, yet surprisingly the keshi is actually more lustrous than the highest quality cultured pearl. Since man probably discovered the pearl while swimming or fishing for food, pearls have been treasured as precious adornments, the world over. Harvested from the pristine waters off the northern and western Australian coast, Australian South Sea pearls are known for their lustrous natural colours of white, silver, gold and rose. They grow from 9mm to 16mm in size, occasionally to 20mm, but that’s very rare. Found in the clear, warm waters of the Pacific of French Polynesia, Tahitian pearls fascinate in natural shades of steel grey, green and purple, to blue and black. Grown off the coast of Japan, white cultured Akoya pearls delight with their cream and pink overtones. Highly lustrous, they rarely grow to more than 9mm in size and are most often used in pearl strands for their uniformity. Freshwater pearls are found in the waters of China. Readily available in sizes from 2mm (called seed pearls) they can now be grown in sizes of up to 12-14mm. The average pearl sold today is between 6.5mm and 11mm. Working with Andrew and his team was an awesome experience considering it’s such a nerve racking time in a young man’s life! Andrew and his team were able to help steer me in the right direction with ring designs and styles based on what I had envisioned Kara’s dream ring to look like. 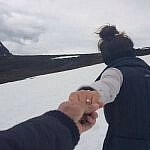 In the end the engagement ring stole the show when it came time to pop the question, which was no easy feat being surrounded by the rich natural wonder of Tasmania! It was 10 out of 10 and I would totally recommend Andrew Mazzone Design Jewellers to my friends and family.